A relief valve is exactly what it sounds like. It is a valve that offers relief from built up pressure. If the relief doesn’t come then the explosion surely will. In terms of chemical makeup, a gas is made up of billions of atoms weakly attracted to each other. That’s what makes a gas classify as a gas and not a liquid or solid. Because of their weak attraction to each other the atoms within a gas fly helter skelter inside whatever container a gas is placed into. These atoms eventually distribute themselves evenly throughout the container and fill it. Adding heat to a gas makes the gas atoms move faster and faster and they begin to hit the side of the container they’re trapped in harder and harder. This creates pressure within the container. The more heat that’s added, the greater the pressure. Create enough pressure and the the container won’t be able to hold the gas within it any more. If the lid of the container isn’t sealed tight it will will pop off. If the lid is sealed tight the container will explode. One way to avoid an explosion is to install a relief valve on the container. When pressure threatens to become unsustainable, open the relief valve and presto, the pressure in the container decreases. This is the key insight behind the invention of the pressure cooker. Incidentally, one of he worlds biggest pressure cooker companies is named Presto. 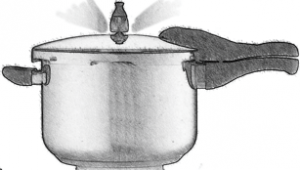 When heat is added to a pressure cooker containing water and food, the water molecules turn into steam (gas). The steam bashes against the sides of the pressure cooker and smashes against the food inside. Once the pressure builds to more than the cooker can contain, an explosion looms. But a pressure cooker has a relief valve allowing for release of enough pressure to prevent an explosion. This relief valve allows cooking at a continuous high pressure, without an explosion, which decreases the amount of time it takes for food to become tender and cooked. We all need relief valves in our lives. As the pressure of work, family and finances build within us sometimes we blow our lid. We let off steam. We explode. That’s okay occasionally as long as we don’t hurt anybody or ourselves. But for the long term it’s better to install a relief valve. A relief valve can take the form of meditation, long walks, great cups of tea. gardening, knitting, sports, listening to music, or a fun night out with a good friend. Whatever it is, using a emotional relief valve regularly prevents pressure building to the point of violent release. Of course, pressure in of itself is not a bad thing. It can cook food faster, it can motivate us to do things, it can get us to complete projects and push past our boundaries. In many circumstances pressure is good and it helps to get things done. For example, our bodies are under continual atmospheric pressure all the time. And that’s a good thing. If it weren’t for the internal and external anatomical pressure, we’d collapse in a mushy heap and die. Pressure is good for keeping us alive and cooking food faster, but when it builds to the point of exploding we run into trouble. We need our relief valve to ensure that doesn’t happen. A mind elevater makes sure they have a relief valve to create continuous, useful pressure that prevents explosions and keeps good stuff cooking.